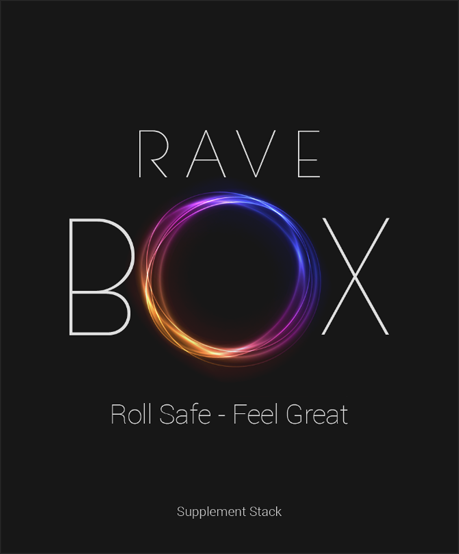 RaveBOX is an MDMA supplementation stack that was created with one goal in mind - to help party people reduce the unwanted after-effects of MDMA (also known as ‘molly’ or ‘ecstasy’). Now you can be healthy while having a great time! With RaveBOX you have all the supplements you need to eliminate comedowns and minimize the risk of neurotoxicity caused by MDMA use. It includes the ideal combination of powerful antioxidants, amino acids, vitamins and minerals that will help you roll safely and feel great afterwards. Taking your supplements at the right time is just as important as taking them in the first place. In each RaveBOX, all supplements are grouped and labeled with time stamps to make things super simple for you while you’re out and about. Each section can be torn-off, so you can easily take it with you to parties in your pocket or purse. Be Healthy – MDMA supplements help you stay healthy while you’re having fun. Take care of yourself so you can enjoy partying for years to come. Have More Fun – taking supplements will enhance and prolong the overall MDMA experience. Feel the Afterglow – feel, sleep and eat for weeks to come after rolling. Not roll more than once every six weeks. Boost your health and wellbeing with the supplement stack that everybody is 'RAVING' about. We stand by our high-quality product and your satisfaction is 100% guaranteed. *Disclaimer - RaveBOX is intended to help maintain a healthy lifestyle. RaveBOX does not in anyway condone or advocate the use of any illegal substances. We make no claim that this product removes negative effects of any illicit substances. It does not treat, cure or prevent any disease.